Where do I begin to write about Iceland? I left Norway in love with Oslo and I was sure Iceland would be just a grim stop, one that would take forever to pass before I went back to Oslo for one more day before my flight back home. That was the plan. Still, I was curious to see this unique land, this big island of fire and ice, proud and pure in its isolation, wind-beaten in the cold waters of the Atlantic. As a child I had been fascinated by the amazing adventures Jules Verne wrote about in his novels, especially the trip to the core of the earth through one of Iceland’s volcanoes. I had come to Iceland on purpose, very interested in its unusual landscape, but never expecting to feast my eyes on beauty whatsoever. I was so wrong. Yes, the weather was cold, only several degrees Celsius over 0 and a really cruel wind was savagely blowing some days, freely whistling over the vast lava fields covered by moss, all the way to the black-sand beaches of the Atlantic. Iceland prepares a shock to the traveller who comes by air as the road from the airport takes you across these desolate fields where there is no blade of grass in sight, only rocks and boulders and stones covered by white-green moss. It was indeed like voyaging onto the moon surface, but the ride was so comfortable and smooth… Icelandic roads are perfect, and, let me tell you, they are great for travel everywhere, even in the middle of nowhere, in the close vicinity of scheming volcanoes or blue-white glaciers… Take my word for it. 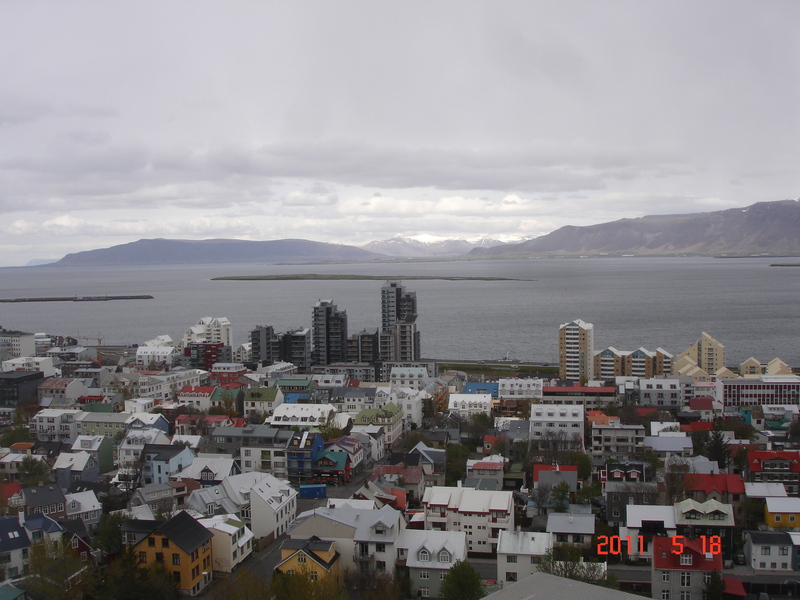 In about 45 minutes I arrived in the capital, Reykjavik – the name meaning the smoky gulf. Here as well as in the towns I passed by on the way, houses are lovely, many of them rather small in order to better stand the harsh weather, surrounded by fir-trees and many flowers. Like in Norway, I have seen many daffodils, lovelier and much larger than at home, mainly because of so much daylight, I guess. In May, the sun sets around midnight and rises around four in the morning. I understand this could be a problem for foreigners, but my wonderful hosts thought of everything and my room had no windows, so I had no sleeping problems. Seen from the highest church tower in Reykjavik, houses are a lovely sight because of the roofs’ wide range of vivid colors. You can also try your eyes from up above, peering far into the blue horizons of the ocean or to the snow-capped peaks of the numerous high mountainous ranges. This combination of sky, ocean and mountains, nesting colorful houses, is very spectacular. 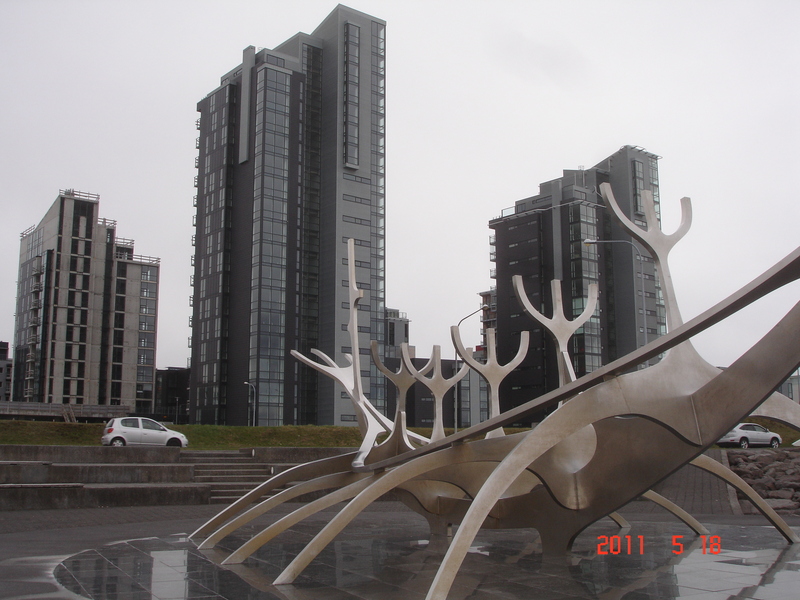 The capital is not big, but its neatness and simplicity are perfect mementos of its proud viking past. You can walk around the entire city in perhaps a couple of hours, from the top of Hallgrimskirkja church to the old fishing harbor, only to wish to spend more hours there, forgetting about time, checking every shop or boutique on the famous Laugavegur Street or just wander on Karastigur Street which is deemed the most walkable street in Reykjavik. I especially liked the Eymundsson bookstore in Austurstraeti street: if the wind outside is too strong and want to warm a bit, you can check the latest international bestsellers there or browse through a large variety of fashion, art or science magazines. On my second night in Reykjavik I had the wonderful opportunity of going to a brass concert in the capital’s brand new concert hall, built on the ocean waters, entirely of glass and steel. This stunnig venue had just been inaugurated a week before and everybody attending the concert was so excited, myself included. The brass band was young but they played so well and the acoustics of the big hall was really great. As the main reason for my going to Iceland was an Erasmus grant for teachers, I spent my mornings in Reykjavik University, also a state-of-the-art building featuring every facility for its students, shadowing the English teacher there and learning a lot. Icelanders are hard-working and very skilled, proud of their past, happy about their present and confident about the future. Everybody speaks English there, from bus drivers to bank managers, so I know my Erasmus coordinator, the English teacher there and the like, must be doing an excellent job. two of the best things I read on a blog lately! just awesome! thanks, Iulia!